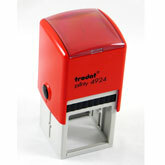 Manufactured on the premises giving a quick delivery time our rubber stamps are made to order. Artwork is needed for company logos or designs but we can typeset text using a range of fonts for address stamps or tabular stamps. We have in stock a full range of ink pads to suit the traditional stamps but self inking stamps are available to order as a more popular item. We have standard pricing structures showing the cost of the stamp whatever the wording or design in either traditional or self inking.